For Secondary and Tertiary Crushing of Aggregate, Mineral, Coal etc. The Roll Crusher usually saves head-room and weight, compact in structure and economical in first cost. lt is capable of large output AT SMALL RATIOS OF REDUCTION. For these reasons, the roll crusher lends itself to portable use or for fine crushing where ratio of reduction does not exceed 3 to 1. Corrugated rolls of different pitch and depth are used for greater RATIO OF REDUCTION and can take BIGGER FEED SIZE. The double roll type of crusher pinches the aggregate only once. To avoid excessive wear upon the roll tyres, it is important that the pinch should be immediate, positive and without slippage. Consequently, larger feed sizes should be avoided, and the ratio of reduction should be kept within the 3 to 1 limit. Any attempt to exceed the permissible ratio of reduction c causes slippage which leads to increased wear upon the tyres, excessive spring action, oversize product and undue unkeep expense. Refer to table on back page for capacities and maximum size of feed recommended. 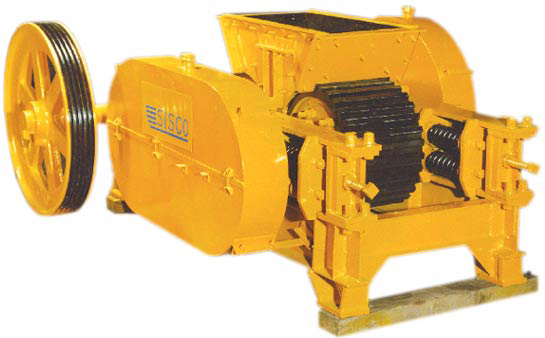 ‘SISCO’ CD-Series Roll Crushers successfully Crushes Aggregates, Limestone, lron Ore, Dolomite Coal etc. 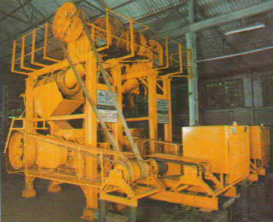 ‘SISCO’ Double Roll Crusher is a very substantially built machine. The longitudinal frame members are heavy steel joist reinforced with extra supports under each bearing cage and at the end. Cross- members are also heavy steel joist which form a rectangular main frame of exceptional strength and rigidity. Two heavy roll units, one fixed and one movable are mounted on this frame. 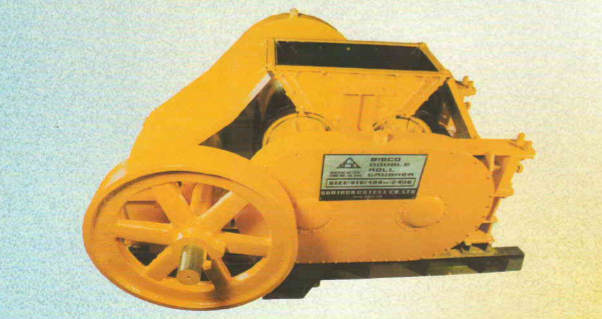 The movable roll assembly is supported by set bolt buffer plates stands and bolts. The other side of the movable roll assembly has provision for inserting adjusting shims. Once these set bolts are released then the adjusting shims can be either added or subtracted. Addition or subtraction of adjusting shims decreases or increases the gap between the rolls. Once the gap is fixed then theses set bolts are once again tightened. The movable roll shaft is driven by the fixed roll shaft by extra heavy steel star-gears. The teeth are of sufficient length to give a wide range of discharge openings. These gears are enclosed in a dust and grease tight steel housing and run in grease. All from roll shaft bearings are equipped with grease fitting and sealed by labyrinth and O-seals. The gear encloser have fittings for draining old grease and filling with new grease. The horsepower required varies with the size of product being made the capacity and the hardness of the rock or ore. The capacities given are in tons per hour based on crushing granite weighing loose about 1.67 tons/Cubic metre. Capacities given are based on 2 metre per second peripheral speed of the roll shells. Wet, sticky feeds tend to reduce capacities, especially at close settings. All feed must be down to maximum size specified in at least one dimension. No crusher, when set at any given discharge opening or spacing between rolls, will make a product all of which will pass a screen opening of the same dimensions as the given discharge opening. The amount of oversize will vary with the character of the rock. For close settings, all undersize materials should be removed from the feed.